Imagine a little boy walking along and spotting a kitten on the sidewalk. He pauses to give it a pat on the head and goes happily on his way. Only the kitten has a mind of its own and starts following the boy. With delight, the boy tries to pick up the kitten, but it scurries away. As soon as the boy turns his back, the kitten returns to continue his pursuit, and so on. Director Albert Lamorisse makes his intentions clear in the opening shot. The young boy happens upon a kitten on the sidewalk before moving on to discover his vivid red costar. (“The Red Balloon” was shot in gorgeous Technicolor and the balloon really stands out against the more muted and rainy Paris backdrops. If you’ve only seen Hollywood Technicolor, you owe it to yourself to experience how creatively the French put it to use.) The balloon becomes a newfound pet for the boy. 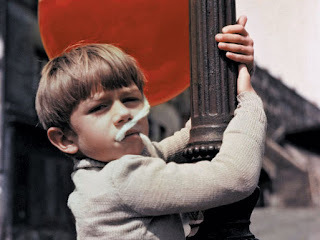 Lasting a mere 34 minutes, “The Red Balloon” effortlessly develops into a full-fledged story filled with helpful citizens willing to offer their umbrellas to protect the boy and his balloon from the rain. The story also has its villains in the form of seemingly countless jealous other boys. They can be avoided and thwarted for a while, but when they have the boy and his pet balloon cornered and take careful aim with their slingshots the game is up – or is it? The ending is, shall I say, quite memorably uplifting. I feel certain that Carol Ballard was familiar with Lamorisse’s boy and his horse film when he directed his own “The Black Stallion.” Both films fall deeply in love with the graceful movement of running horses and the photography (in “White Mane” it is striking, Italian neo-realistic inspired black and white) richly displays that love in every shot. Both films also present the relationship between boy and horse as a mutually and gradually developing friendship, very poetically expressed. And as with “The Red Balloon,” “White Mane” has its villains, this time a band of men depicted as almost pure evil that capture and tame wild horses. They’re just ranchers doing their jobs of course, but the film sees them through the horse infatuated eyes of the young boy, as something to be feared. This leads to a few moments that may prove a bit frightening (so sit close to your kids) including a fight between White Mane and another pent up stallion that is a bit brutal as well as quite remarkable and even beautiful to watch. Of course, White Mane and the boy prevail and escape the “evil” men. The ending to this 47 minute film isn’t quite as clear as with “The Red Balloon” though. My younger daughter (age 11) sat for a bit after the film was over weighing two possibilities, one happy and one sad. Being a happy kid in general, she settled comfortably on the first option. This pair of classics makes for a great introduction to French cinema for young movie fans. Both are largely visual poems that play like classic fairytales. They also won’t pose any challenges to young viewers lacking the reading skills for subtitles. “The Red Balloon” is almost wordless and has about 30 words of subtitled French dialog none of which are essential to enjoying the film. “White Mane” is being presented in an English translated version. So, don’t forget the kids – and don’t forget the popcorn – and settle back for a unique experience, for young and old.